Puts 8 programmable effects loops at your feet! If you use lots of effects pedals but get tired of pressing a bunch of footswitches to turn multiple pedals on or off, the Combinator 2 will put a smile on your face. With the Combinator 2, switching is easier, smoother, and you even save batteries. 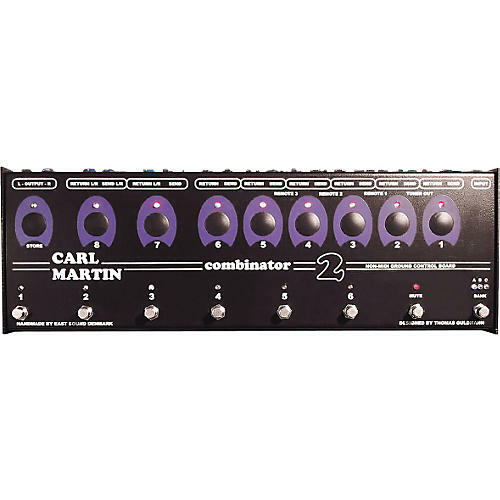 The Combinator 2 features 8 effects loops, 18 programs, tuner output, master mute, a power supply providing 8 individual 9-volt taps, and 3 external switches on separate outputs. Each pedal is connected to one of 8 individual effects loops (2 with stereo returns) and then assigned to one or more of 18 groups. Pushing the program switch for a group simultaneously engages all of the pedals assigned to it. Assign a fuzz pedal, wah, and chorus to program switch one and hit the switch once to turn them all on or off. Programming is a snap. Just select a bank and press one of the program buttons, press the soft buttons corresponding to the pedals you want to include, press store, and you're done. Got an armload of effects pedals you want to use? Order the Combinator 2 and get stomp happy.